When we stopped moving forward for the day, I'd walk back through the rice paddies to join up with the rest of the troops and shoot the breeze with the guys over some dreadful C-rations and horrible military-issued coffee. I was an S-2 Scout and walked point for Delta Company, 1st Battalion, 3rd Marines, in Vietnam, 1968. I was in charge of three rehabilitated Viet Cong, who walked alongside me. Thom, Tong and Lekian. All three had been high-ranking enemy soldiers. They'd come over to our side. They were razor-sharp in detecting enemy ambushes and booby traps. They assisted me with interrogations of villagers and captured Viet Cong or NVA. Good guys. Still, I only trusted them so far. My fellow Marines and I had gone through some tough battles together. Including making it through the Tet Offensive. We were brothers. We knew we could count on one another. All of us, proud members of the "Lean Green Fighting Machine." Inasmuch as men can love one another, we did. Most of us were 19 or 20 years old. A bag of misfits, college dropouts and naïve kids. Almost all of us were drafted. Others, including myself, volunteered. Many of us had been "hit" once or twice. I remember thinking that it was gonna take a lot more than that to beat me. We all felt that way. We were young and proud Americans. Usually, I was out in front of the rest of the battalion, by a couple hundred meters. Some Marine would run up to my position to let me know that we were stopping for the day. As soon as I got back to the rest of the guys, on my way to a short briefing from Capt. Fox, I'd hear the shout-outs. "Hey, Stamps, where we going tonight? " I'd holler back, "We're on our way to the Sunset Strip, boys. See if we can't get next to some sassy girls at the Whiskey-A-Go-Go. It's gonna be a good night. I guarantee it!" After we dug in and cleared the perimeter, a bunch of us would get together and find a way to forget the horrors we had endured. We called ourselves the Dirty Dozen. Not terribly original, but that's roughly the number of us who hung out together. There was Todd from Wisconsin. A short, red-haired guy. Glasses. Sunburnt. Freckles all over. He flunked out of some Ivy League college back East. They drafted him shortly thereafter. Pete, from Philly. His wife gave birth to his first child the second month he was "in country." A little girl. He tucked their picture up front under a black elastic band that ran around his helmet. Mike, from Philadelphia. A blond-haired, wannabe surfer with an attitude. The judge had told him, "It's jail or the service." He joined the Marines. He was quiet. Zeke was from Wyoming. A real cowboy. Tall and skinny, with a gap between his two front teeth. He wrote to his fiancee every day. They were high school sweethearts. You couldn't get through a conversation with him without hearing all about her. He planned on marrying her when he got back home. There were several other guys in our group. A couple of them were from Texas. Two more from Alabama. A few others from all over. Then there was my best buddy, Paul. He, too, was from Philly. Short and stocky, with a Hollywood tan, a million-dollar smile and a raspy voice. He walked with a slight limp. Paul was eight or nine years older than the rest of us. 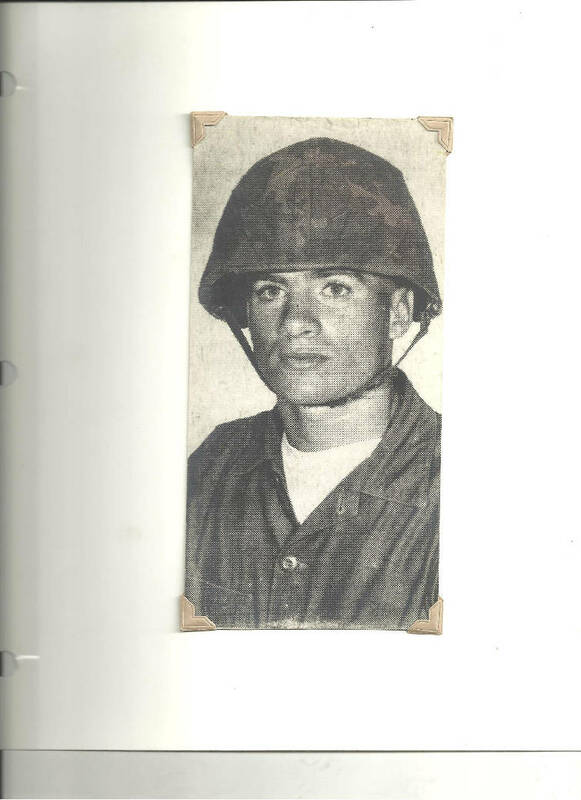 He had been in the Marine Corps for 10 years and was on his second tour of Vietnam. He told me that as soon as he got back to the "world" he was getting out. In civilian life he had been a real-life pimp. As many as 25 or 30 guys huddled up around us. Paul and I would stand up and start our show. Paul would give me my lead, "Where are we, Stamps?" I'd say, "We're standing in the middle of the bar at the Whiskey. There's a huge mirror above us. That way, we can see all the chicks in this place without having to turn around." I'd continue, "Look in the mirror, Paul. We got it goin' on. Clean, man. My hair's long. Sideburns. Bell-bottom jeans. I like my leather jacket, man. Red, with just a white, V-neck T-shirt underneath. You're lookin' good, Paul. Tanned. All dressed in black. Beatle boots. That gold chain around your neck's sparkling. That big gold watch. Your hair is just past your collar. You look clean as a dime, man." Paul would look up and into my imaginary mirror, and say, "Yeah, man, we look good." Then me, "Hey, Paul. Look in the mirror. Check it out. Those girls are staring a hole through us. A whole table full!" I continued, "Looks like they just came from the beach. That blonde, with more curves than the Ohio Turnpike, is smiling at you, Paul. This is gonna be a good night." More approving cheers from our audience. I'd say, "You take her, and I'll chat up the blonde, with the ponytail, next to her." I'd yell over the imagined bar crowd, "Bartender, send over a round of drinks to those girls and tell them we'd like to get next to them tonight." Somebody would yell out, "What's the rest of the girls look like, Stamps?" I answered, "They're all good-looking and love Marines. We're all getting lucky tonight, fellas!" A big whoop from them. Fatigue and concern, set aside for the moment, to visualize my scenario and travel with me, back to the States. Loud cheers for "make believe." We all wanted to be home. Sometimes, the show would go on for over an hour. That's the way it went on those hot and sweltering late afternoons over there. As the day drew to end, we'd dig in for the night and keep an eye on the horizon. We'd be lucky to get three hours of shut-eye. During a firefight, I was 10 feet from Pete. I had to crawl on my belly from the horseshoe ambush we had walked into. I finally made it back behind a Vietnamese grave, where Pete was laying them out with his M60. He looked at me, with that big toothy grin of his, and yelled out, "Where ya been, Stamps"? A minute later, they shot him right between the eyes. Mike and Todd were fatally wounded by incoming mortar fire. I watched Zeke stand straight up and just start walking toward incoming enemy fire. We were screaming at him, at the top of our lungs, to hit the ground. He just kept going. They blew him up. His fiancee had written him a "Dear John" letter. She had found another. Shattered nerves and a broken heart were what really killed him. All the rest of the guys in the Dirty Dozen died over there. I was the only one who made it. Or so I thought. I had been told my buddy, Paul, had been killed too. We lost track of one another. I got hit, and they choppered me out of the jungle. I never did catch back up with him. Twenty-five years later, I found out Paul made it. A friend of his family told me that Paul came home "all messed up." He just kind of wandered around the country, working odd jobs. He said that Paul had a drinking problem. The last he heard, Paul was living in upstate New York, working in the landscape business. I looked around for him for a while. I don't think he wants to be found. He probably doesn't want to talk about it. I understand. Me either. Happy Veterans Day. And belated birthday wishes to my fellow Marines. Gentlemen and ladies, celebrate the freedom you've protected. Thank God that you're alive. Bill Stamps is a native Tennessean who spent four decades in the entertainment business before leaving Los Angeles to return to his roots in Cleveland, Tenn.